The annual meeting of the International Society of Hymenopterists took place on 16 November in Portland, Oregon. Dr John Noyes (NHM, London) was awarded in person the ISH Distinguished Research Medal. Congratulations again to John! Four excellent presentations were given during the student competition. Carly Tribull (American Museum of Natural History, New York) was awarded the best presentation for her outstanding talk: Pincher wasps and their prey: Geometric morphometrics, morphology, and molecules contribute to the phylogeny of Dryinidae (Hymenoptera: Chrysidoidea) and the study of host-specificity. Four excellent presentations were given by students at the meeting; Carly Tribull was awarded the best presentation. Presentations: Lawrence Haimowitz, University of Wyoming, Laramie, WY: Caenophanes (Hymenoptera: Braconidae): A doryctine genus new to the new world; Judith Herreid, University of California, Riverside, CA: Pondering parasitoid planidia: Biology and systematics of the ant parasitic genus Orasema (Eucharitidae); Ryan K Perry, University of California, Riverside, CA: Variations on a theme: Investigating color patterns and species delineation of Zagrammosoma (Hymenoptera: Eulophidae); Carly M. Tribull, American Museum of Natural History, New York, NY: Pincher wasps and their prey: Geometric morphometrics, morphology, and molecules contribute to the phylogeny of Dryinidae (Hymenoptera: Chrysidoidea) and the study of host-specificity. The session was moderated by Jim Woolley and John Heraty. No applications have as yet been received for the Student Representative (due August 31). ACTION ITEM: a new email call needs to be sent out to the membership encouraging student to apply for this position (new deadline January 1 2015). Membership dues for the Society are waived, and we encourage solicitation of candidates from both members and non-members. ACTION ITEM: We need to send out a reminder of the deadlines for the Archivist position. ACTION ITEM: We need to send out a reminder for proposals to the ISH 2018 International Congress, due January 1, 2015. ACTION ITEM: Send out email reminding that the next issue of Hamuli will be in late February (content needed). Also, the editors are looking for feedback on content, design, etc. Andy Deans (ard19(at) psu (dot) edu) has a PhD opening to work on Ceraphronoidea. The project is highly integrated and includes a lot of travel to exotic places. ISH should consider sponsoring a Hymenoptera Symposium for the ICE meetings in 2016. Note that the deadline for submissions is March 2, 2015, every presenter can only have one primary talk or poster at the meeting, and sessions with sponsors will get higher consideration. We provided $1500 in travel funds to ICE presenters in Korea. We could offer the same sponsorship for Orlando (note the last item was not discussed at the meeting, and should be discussed by the Executive Committee). The ISH student symposium and business meeting will take place on Sunday, 16 November from 1:15 PM to 4:20 PM. The event will take place as part of this year's ESA meeting in the Oregon Convention Center (Rooms A107-109). 1:15 PM Lawrence Haimowitz, University of Wyoming, Laramie, WY: Caenophanes (Hymenoptera: Braconidae): A doryctine genus new to the new world. 1:35 PM Judith Herreid, University of California, Riverside, CA: Pondering parasitoid planidia: Biology and systematics of the ant parasitic genus Orasema (Eucharitidae). 1:55 PM Presentation of ISH distinguished research medal to Dr John Noyes. 2:55 PM Ryan K Perry, University of California, Riverside, CA: Variations on a theme: Investigating color patterns and species delineation of Zagrammosoma (Hymenoptera: Eulophidae). 3:15 PM Carly M. Tribull, American Museum of Natural History, New York, NY: Pincher wasps and their prey: Geometric morphometrics, morphology, and molecules contribute to the phylogeny of Dryinidae (Hymenoptera: Chrysidoidea) and the study of host-specificity. 3:40 PM ISH Business meeting, incl. presentation of cash prize for best student talk. 4:20 PM Reception at "Spirit of 77". We are pleased to announce the 6th offering of the HYM Course to be held at the CRILAR_CONICET station in Anillaco-La Rioja, Argentina, March 1-9, 2015. This is the only course that offers a complete coverage of the entire order Hymenoptera, including collecting techniques and curatorial methods. This offering will feature a symposium on the last day focusing on a breadth of research topics covering hymenopteran phylogenetics, biology, ecology, biocontrol, etc. Details are available at: www.hymcourse.org. Anillaco, at 1450 meters above sea level, is located on the foothills of the Sierra de Velasco (maximum elevation 4,500m). The climate is desert, with annual rainfall of ~180 mm per year, with minimum winter temperatures of -12C and maximum in summer of 38 C. The foothill vegetation development reaches a mountain forest in some places where streams flow down from the mountains. Three meals are served daily along with a coffee break each in the morning and afternoon. Vegetarian options are available. Special diets (halal, vegan, gluten-free, etc.) cannot be accommodated. Deadline for application is November 28, 2014. Notification of acceptance by December 19, 2014. Dr Andrew Polaszek, NHM London, has been elected as the incoming president. John Noyes has published 90 articles and 10 monographs on Encyrtidae and Mymaridae. He has published 3 books on Costa Rican Encyrtidae (1,662 pages). He described about 1/4 of almost 4,000 species and 493 genera of Encyrtidae. He developed the Universal Chalcidoidea Database (>35,000 references). He designed the “Noyes” sweep net – the standard net for collecting microhymenoptera. He added 400,000 mounted and labelled specimens of Chalcidoidea to the NHM collection. It is planned to have the award ceremony at the upcoming ISH business meeting during the ESA meeting in Portland, Oregon (16 Nov 2014). Rebecca Kittel (University of Adelaide): "Phylogenetics and biogeography of chelonine wasps (Hymenoptera: Braconidae) based on a fossil calibrated multigene analysis"
Petr Jansta (Charles University, Prague): "Molecular phylogeny and evolution of the family Torymidae (Hymenoptera: Chalcidoidea) - are Torymidae really monophyletic?" Crystal McEwen (University of Maryland): "Progress in the revision of Disholcaspis Dalla Torre and Kieffer"
Bernardo Santos (American Museum of Natural History): "On the road to a total evidence phylogeny of cryptine wasps (Ichneumonidae, Cryptinae)"  Erika Tucker (University of Kentucky): "An updated phylogenetic analysis of Cremnops (Hymenoptera: Braconidae) incorporating the minibarcode region of COI"
Mabel Alvarado (University of Kansas): "Revision of the South American wasp genus Alophophion (Hymenoptera: Ichneumonidae: Ophioninae)"
Candice Owen (Rhodes University): "Wingless wasps in the water -What?!?" 160+ participants from 28 countries attended in the meeting. President Heraty thanks the local organizing committee, chaired by Frank Azorza and Dr Erick Yabar, the members of the scientific committee chaired by Marcel Hermes and Angélico Asenjo, the editor of the conference book. Thanks are also due to Lidia Sulca Garro and all volunteers for taking care of the local organization. Eight sponsors provided financial support (Bioquip, Bugdorm, CSIRO, Entomological Society of America, Entosphinx, Pensoft and Princeton University Press). proposals to include a brief outline of reasons for location (reasons for location: unique location or long overdue, access to a unique membership, location appeal, identification of a team of local organizers and support network, potential venue, potential registration and meeting costs, and opportunities for fieldwork. All points are to be addressed. proposals will be evaluated by the Executive Committee and requests for successful bidders to be returned by February. successful bids would be required to submit a more complete bid by May 30 that would include more details on the hotels, room charges, registration estimates and a business plan for the meeting, post-congress activities such as collecting trips, and congress activities such as visits to nearby natural areas and tourist locations, archeological or historical sites, etc. the successful bid will be evaluated by the Executive Committee and announced by July 1 of the same year. There is a brief discussion concerning the length of the ISH presidency (2 years). This means that the president who handles the applications for the upcoming ISH congress will not be in charge during the congress. It also becomes clear during the discussion that also in the future a rotation of continents will be preferred. A discount for publication costs of student papers would be desirable. The layout of the journal artificially inflates the page numbers. Pensoft seems to object to a larger page format. The 5 year contract with Pensoft ends in 2016. The new ISH executive under incoming president Jim Whitfield will prepare a document with suggestions to send to Lyubomir Penev. The balance of ISH will be around $6,500 USD by the end of 2014. See slides of business meeting for details on income and expenses. The total of the ISH endowment funds is $70,130.21 USD ($70,130.21 savings, $15,364.68 time account). Currently the endowment funds do not create any interest rate. A slightly less risk-conserved strategy might be necessary to gain interest in the future. The number of ISH members show a very positive trend. In 2014 ISH has 285 members (191 regular, 73 student, 12 life). This is a plus of 98 members. The reasons for the membership increase are the ISH congress and probably also the increase of reminder letters. However, 13% of former ISH members (36 in total) have still not renewed for 2014.
attract potential members from fields that are not well covered by ISH, yet). Should also outline the mission of the society and the advantages of being a member. Could be a task for the new archivist. • We should link more activities that already exist in our society (e.g., Hymenoptera course, workshops) to ISH. • The Blog is now open for everyone. Members can become contributors or send content to ISH officers. One list that comprises only the current members (i.e. those that have renewed). One list that comprises also the list of members that have not renewed for the current year. Only current members will receive hamuli. Past members will still receive renewal reminders. • Should ISH sponsor meetings such as ECN? Who wants to be the next Student rep? Interested students should send one page motivation letter, including goals, cv, and supporting letter from supervisor by August 31, executive Members will make a decision by October, position will commence in November (during ESA). The ISH website becomes increasingly popular with hits from most countries of the world. The website should get a new look and should be part of a professional management site (groupspaces). The costs would be $19.99/month. It is agreed to have the website managed by groupspaces. ISH should have an archivist position, which will be advertised by the executive. Barbara Sharanowski suggests digitalizing the Braconid Manual and having Spanish and English pdf versions that are OCR readable and comprise hyperlinks. A list of recently passed ISH members will be published in hamuli. The following will be included: Dr Fred Gess, Dr Alan Hook, Dr Klaus Horstmann, Dr Charles Porter. John Heraty will stay as Past President in the ISH executive and welcomes Jim Whitfield as current ISH president. Jim Whitfield thanks John for his great presidency, which included the organization of the successful Cusco meeting, and closes the ISH business meeting. I am happy to share with you some more good news from the Journal of Hymenoptera Research, besides the increase of its Impact Factor to 0.966! I am pleased to inform you that the Journal of Hymenoptera Research moved to a brand new editorial platform available at http://jhr.pensoft.net. Enjoy for example the list of taxa showing their usages through the paper, the interactive online map, the article and sub-article level metrics, the figures, the taxon profile, and much more. Easy navigation and discovery is provided through several filters on the left bar of articles and authors browsing pages. The Refindit.org tool embedded in the reference page allows you to search for online versions of an article and published data through several trusted sources such as CrossRef, PubMed, Mendeley, RefBank, DataCite and others. Please do not hesitate to complete your personal profiles with portrait photos and eventually correct/amend your areas of interest. The old platform and web address will still exist for a while, until we finish the editorial work on the manuscripts that are still in review. 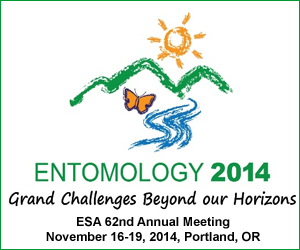 We will have an ISH student symposium at this year's ESA meeting, which will be held in Portland, Oregon (http://www.entsoc.org/entomology2014). This is a great opportunity to present your research to people that love Hymenoptera as much as you do! If you are interested in submitting an oral presentation, please submit your talk title, brief abstract and author list by May 12, 2014. Please add the affiliation for all authors and indicate your student status. Questions and talk information should be emailed to lars.krogmann(at)smns-bw.de There will be a cash prize for best talk! Bernardo Santos (American Museum of Natural History): "On the road to a total evidence phylogeny of cryptine wasps (Ichneumonidae, Cryptinae)"
Erika Tucker (University of Kentucky): "An updated phylogenetic analysis of Cremnops (Hymenoptera: Braconidae) incorporating the minibarcode region of COI"
For further information please see the official announcement in English or Russian. Ukrainian Entomological Society in the cooperation with the I.I. Schmalhausen Institute of Zoology of National Academy of Sciences of Ukraine (Kiev) and Institute for Evolutionary Ecology of National Academy of Sciences of Ukraine (Kiev) (former name is the Scientific Centre for Megalopolis Ecomonitoring and Biodiversity Research of National Academy of Sciences of Ukraine) announce the preparation for III-rd Symposium of CIS countries (Commonwealth of Independent States) on hymenopterous insects (Hymenoptera) which will be held on May 26th–30th, 2014 in Kiev, Ukraine. The International Society of Hymenopterists invites student and postgraduate researchers (recently graduated or postdoctoral researchers) to submit applications for travel awards to the 8th congress in Peru from July 20-25, 2014. Funding for awards is limited, with a maximum award of $1500 plus a registration waiver ($240). Proposals will be competitively judged based on a consideration of the following factors: a) presentation of a poster or oral presentation (abstract and title included); b) one page resume; c) one page letter from supervisor, d) indication of any other potential funding source. 1. Eligibility: current graduate and postgraduate students; must be members in good standing of the International Hymenopterists Society; eligible applicants may not have received a previous ISH travel award (i.e., to ICE in Korea). 2. Provide a brief budget for the trip. Are other funding sources available? 3. Awards: Typical award amounts will range from $500 to $1500 plus a waiver of registration fees. A. 1 page that includes the title and abstract of the presentation (indicate if you plan a poster or oral presentation), a brief outline of the overall research being conducted, and a brief budget (<$1500). Please be realistic about what you will need. Also, please state if you can still attend with a lesser award ($500-1000 plus a registration waiver). B. 1-2 page detailed biography with publications and presentations. indicates your status and a recommendation for this award. Please email applications as a single pdf file to Jim Whitfield (jwhitfie@life.illinois.edu) on or before February 27, 2014. Successful applicants will be notified around mid-­March.